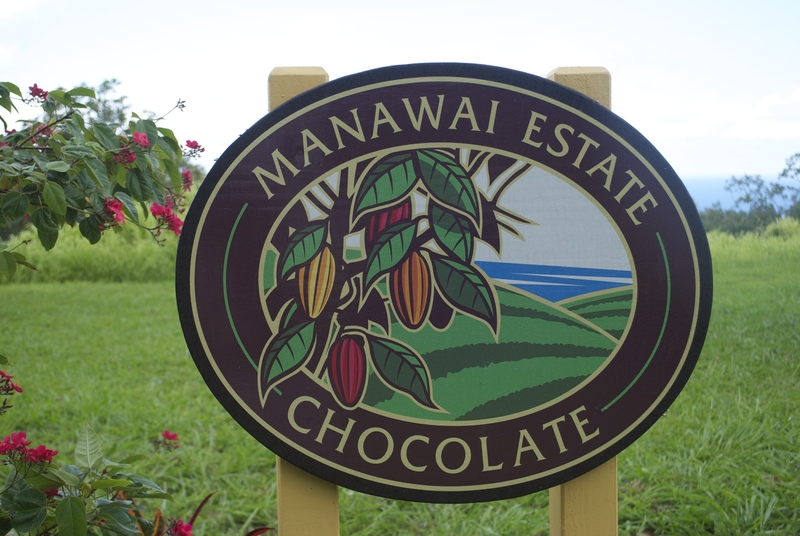 There was a tour of the farm, where we followed the chocolate making process, from bean to bar. 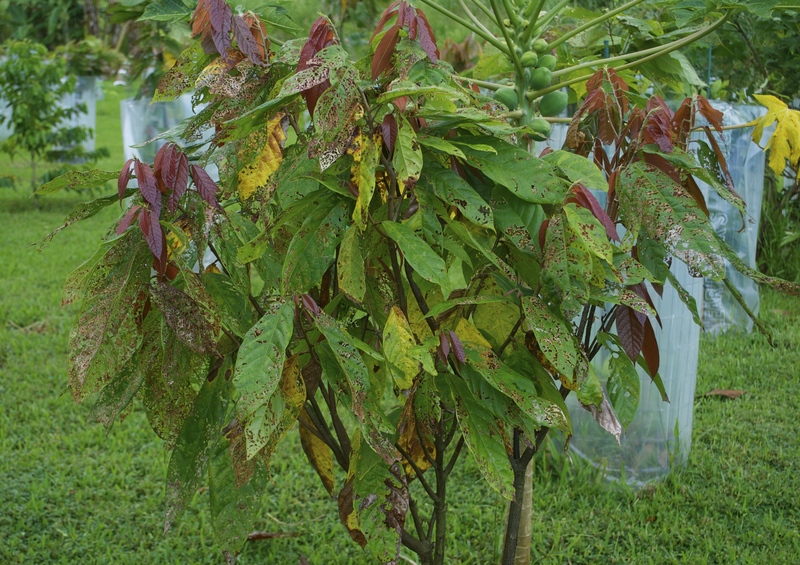 Like apples, each seed inside a cacao pod will produce a genetically unique tree. 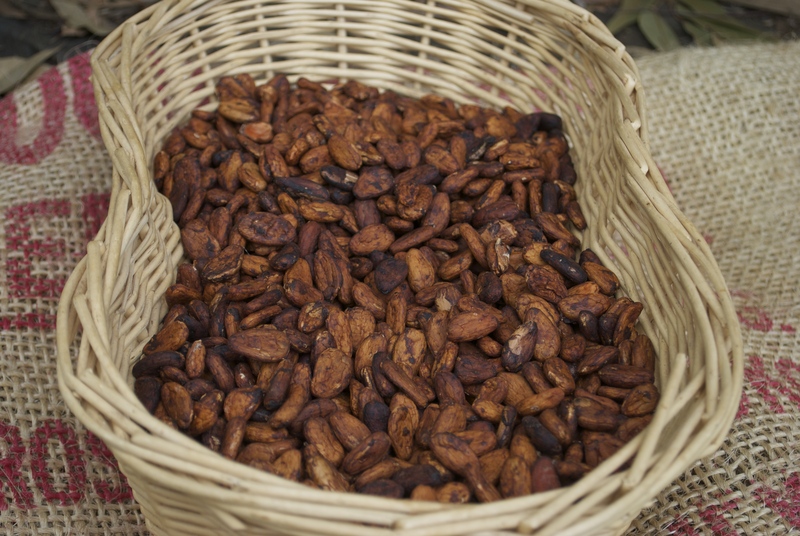 The cacao pods come in a vast array of colors and flavors. 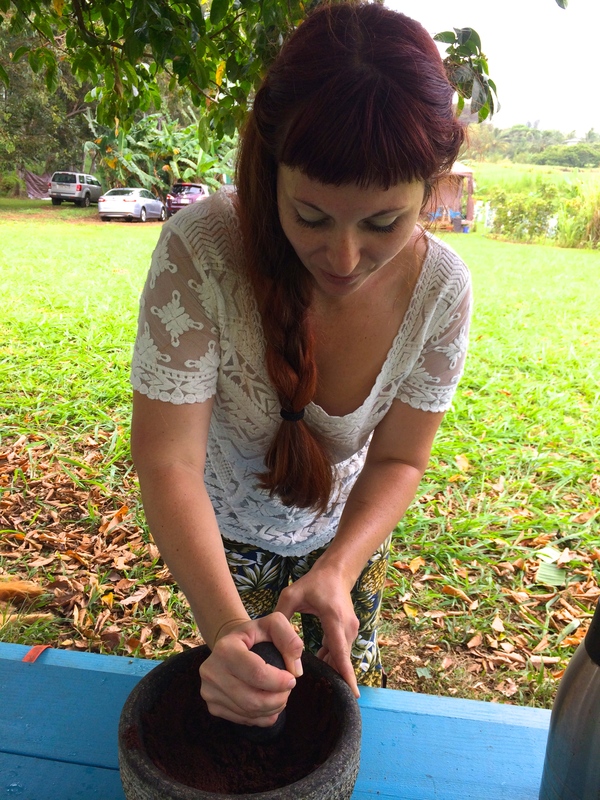 Crushing fermented and roasted beans. After the tour, we sat down and had a chocolate tasting. We sampled different varieties sourced from all over and noted their differences. It was the perfect, slightly rainy half day away from the mess at my house. So perfect in fact, that I felt inspired to bake (the kitchen left mostly dry, miraculously!). The bananas on Maui in the fall are the most beautiful bananas you’ve ever seen. I visited my favorite farmer’s market where I picked up an ice cream banana as well as a couple of gorgeous red bananas. My friend Ashley also gave me a whole bag full of her apple bananas, so I was loaded with them. 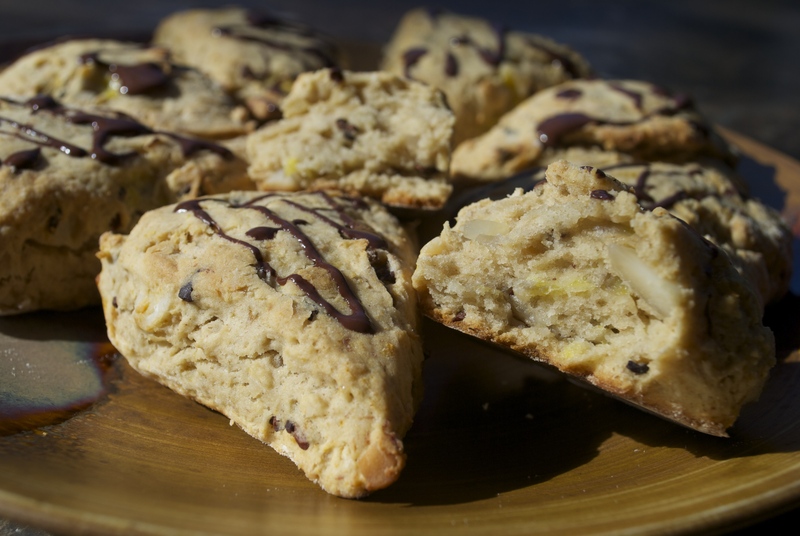 Coupled with some of the chocolate and cacao nibs I had gotten, a scone was born. 2 tbsp-1/4 c cacao nibs (add however much you like) OR chocolate chips if you don’t have nibs. Preheat oven to 425°F. Prepare a baking sheet with parchment or a silpat. Whisk dry ingredients together in medium mixing bowl. Add the chopped nuts. Use a pastry cutter to cut in the Earth Balance. In a separate bowl, combine the banana and coconut milk to create1 c liquid. Add the banana/milk mixture to the bowl, along with the liquid sweetener and vanilla. Mix until all of the wet ingredients are just incorporated into the dry to form a dough. Lightly flour a cutting board or work surface and pat the dough into a circle–about an inch deep. Slice or cut out 8 scones. Place them on the prepared baking sheet. Bake for 15-18 min or until golden. Wait for the scones to cool for a bit before putting on the chocolate, but don’t let them get cold. The fresher, the better. Melt chocolate in a double boiler or the microwave, but don’t scorch. Mix in the coconut oil and sweetener. 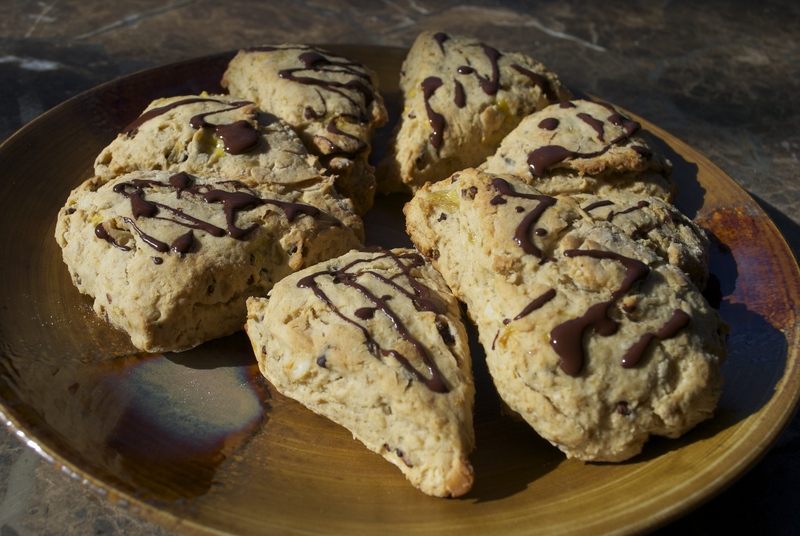 Drizzle over scones, or dip the scones tips into the chocolate. ← Fluffy Vegan Buttermilk Biscuits w/ Cheddar & Black Pepper.